Gear motor is a motor that has a gear reduction system or the gearbox integrally built into the motor. The gearbox increases the torque generating ability of the motor while simultaneously reducing its output speed. The main advantage of a gearmotor is that the driving shaft may be coupled directly to the driven shaft. Belts, pulleys, chains, or additional gearing to step down motor speed are needed. Also, coupling or belting of a motor to a separate speed-reducer unit is eliminated. 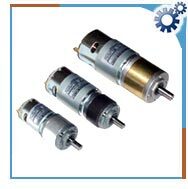 AC gearmotor consists of a series of three windings in the stator section with a simple rotating section and an integral gearbox. DC gear motors are configured in many types and sizes, including brushless and servo. They consist of a rotor and a permanent magnetic field stator and an integral gearbox. They are used in variable speed and torque applications. Direct motors are most common in industrial robots. Important performance specifications to consider when searching for gearmotors include shaft speed, continuos torque, continuos current, and continuous output power. The terminal voltage is the design DC motor voltage. The continuous torque is the output torque capability of the motor under constant running conditions. Continuous current is the maximum rated current that can be supplied to the motor windings without overheating. Continuous output power is the mechanical power provided by the motor output. Gear motors are designed and manufactured to be installed within another device. The installation place should have ambient temperature of about 14 F ~ 104 F and ambient humidity of maximum 85%. The motor should not be exposed to explosive, flammable gas, to direct sunlight, dust, water, and oil. It should be placed where heat can easily escape. Using gearmotors in location that does not satisfy the conditions can damage the motor. Gearmotor service factors and load classifications should confirm to AGMA recommendations. The minimum service factor should be 1.0 for continuous operation and the minimum gearing service factor should be 1.0 with a minimum mechanical strength service factor of 1.3. Gearmotors have a variety of successful applications. They are used in packaging and labeling, case erectors, box taper, hot melt glue pumps, heat shrink tunnels, tape dispensers and conveyor drives. They are also used in food processing industry. They are used in ice making machines, weigh checking, baking machinery, meat slicing, cooker drive, and breading equipment. In transport equipment they are used in wheelchairs, stair lifts, golf carts and pipeline crawlers. In machine tools they are used in drill heads, rotary table drives, and hardness test.